In Honor Of Design: True Beauty Files: Mixing prints. True Beauty Files: Mixing prints. So the debate on colored denim was between golden yellow and jade green...I ended up with coral. Its an all time favorite color. After trying on colored denim at HM and Target, these fit the best. Are you adding fun colored denim to your spring line up? Let me know if you have found a good pair! Style Word: There are so many fun ways to mix prints this season. I layered two prints above as one option. Liz has a great round up of more print mixing ideas for you to check out! P.S. Check back in tomorrow for a fun new giveaway and the winner of the Poshlocket giveaway (you still have today to enter)! i LOVE colored denim! i am totally on the hunt for a coral pair!! Anna, you really had no problem getting back to your normal size after having a baby ha! so jealous! I have been loving colored denim lately and looking for a nice light mint one for awhile. You are so cute- LOVE this outfit...pink/coral denim is my favourite! LOVE the coral. thats a color i would do for sure. i need this whole outfit. The peek of hearts is just too cute! Loooooove this outfit!! it's like a modern Audrey Hepburn.! Love this outfit… Anna, you are precious! Such a pretty and classy look, I love the layering! as always, looking so cute and classy! love this look...and those shoes are so great! You look gorgeous as always! I LOVE mixing patterns! Love your colorful pants. Its so funny! I was having the debate between green and coral... I think I am going coral! This outfit is adorableeee!! Love those shoes. And the pattern mixing is done perfectly! Love it! They look stunning on you! I'm totally thinking emerald jeans...but we'll see. I've been swooning for white jeans as long as I can remember, and this might be the year I pull the trigger! This is great! The sweater is my favorite. Looking super cute Anna! Looks like we're both mixing patterns and prints on the blogs today! ok, this outfit takes the prize :) love everything. from your hair to your toes. beautiful, have a great one! I like the pattern mixing - it's subtle. I love the coral pants too. They don't seem too bright but that might be the post-processing. You look so lovely! I love the black white and pop of coral. Very chic! ahh loving this mix of color and prints! you look great! ANNA! You are always too cute for words :) I hope your having a wonderful day! Wow amazing outfit! Nice blouse and pants! Great blog! I loove this outfit!! I just bought those same pants from ON and I am soo excited to wear them. But those shoes are amazing!! I need to get me some colored denim as soon as I'm off of this shopping ban :) That necklace is BEAUTIFUL! I think you did a great job on it! You look great. And girl, can we swap buttons? I love the coral denim you chose! Such a perfect color for spring :) I also really like how the block stripes look with the small print shirt underneath. Beautiful! Love this look and love mixing prints. Just bought some red denim too! those shoes! aah!!! i can't get over them. i have almost an identical pair of coral jeans that im obsessed with. i also posted as a part of the true beauty files today! You are an absolute rock star in my book, Anna. Not only do I completely fail at mixing prints, I can hardly buy them at all. I don't know why they give me such problems, but they do. Adorable, Anna! Always looking so classy and fun :) I snagged a pair of lilac colored denim at Anthro when they were on sale a few months ago...they're AG brand and I love them! Super comfortable. I have that heart tank. very cute! Beautiful mix! 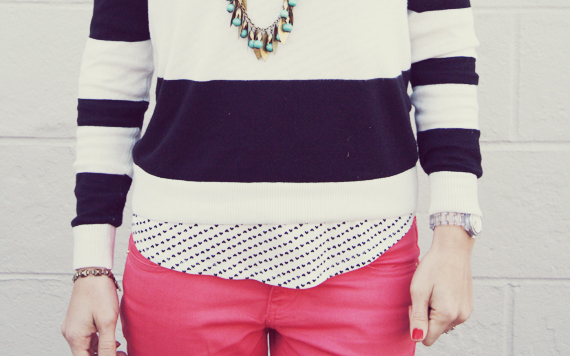 Love stripes with dots. And the pop of color on you pants is perfect. seriously? you are the cutest. love this friend! you look amazing as always. Love the mixing of prints!! I need to give that a try!! totally cute! red and stripes is a perfect mix. i always enjoy your outfits and styling. this one is great, so bright and hooray for mixing prints. I tried on the colored skinnys at my store (AE) but didn't like the way these particular skinnys fit me. I am excited though because I learned that the knit jegggins from AE are making a come back for Back to School and there will be new colors. You've probably seen me talk about them before. They are the most comfortable pant! I can't wait to see what colors they come out with! Anyhow, I'll definitely have to try the ones over at H&M. I didn't realize they had colored pants right now! I love the coral jeans, what a great color!! I think this is one of my favorites of yours--I love the subtle mixed prints, the pretty coral jeans, and those awesome shoes! Loving this outfit! I have that same sweater :) I just got my first pair of colored jeans, red ones. I think I might try out this sweater with my red jeans! Thanks for the inspiration!